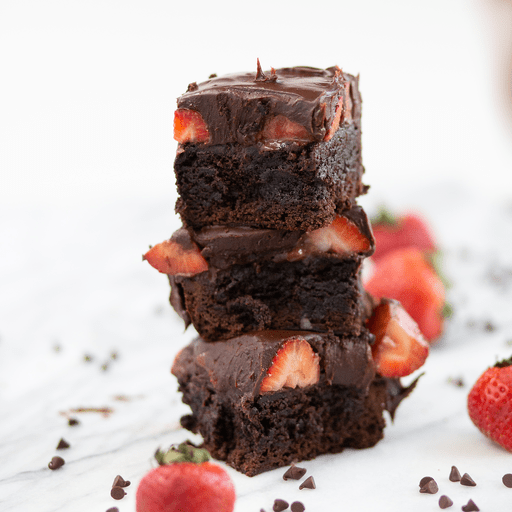 Fudgy brownies, fresh strawberries and chocolate ganache come together to create the ultimate sweet treat. We know you'll fall in love with this decadent dessert! 1. Line an 8x8-inch pan with parchment paper. Prepare brownie batter according to package instructions using prepared pan. Let cool completely, then top with strawberries. 1. To make the ganache, place chocolate chips in a medium bowl and set aside. In a small saucepan, heat heavy cream over medium heat. When the cream starts to bubble around the edges of the pan, remove the pan from heat. 1. Pour the hot cream over the chocolate chips. Let sit for 5 minutes, then whisk constantly until ganache is smooth. Pour ganache over strawberries. 1. Refrigerate brownies until the ganache is set, about 15 minutes. Slice and serve cold. For gluten free: Use gluten free brownie mix in place of standard brownie mix. Per Serving: Calories 410, Total Fat 27g (Saturated 10g, Trans 0g), Cholesterol 40mg, Sodium 110mg, Total Carbohydrate 43g (Dietary Fiber 0g, Total Sugars 31g), Protein 4g, Vitamin D 0%, Calcium 2%, Iron 10%, Potassium 4% *Nutritional values are an approximation. Actual nutritional values may vary due to preparation techniques, variations related to suppliers, regional and seasonal differences, or rounding.